In 2010, total knee replacement was the most frequently performed inpatient procedure on adults aged 45 and over. 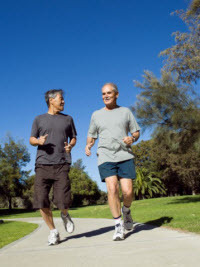 In the 11-year period from 2000 through 2010, an estimated 5.2 million total knee replacements were performed. Adults aged 45 and over comprised 98.1% of those surgeries. An NCHS report uses data from the National Hospital Discharge Survey to present trends in the rate of hospitalizations for total knee replacement, mean age at hospitalization, and discharge status for inpatients aged 45 and over from 2000 through 2010. The rate of total knee replacement increased for both men (86%) and women (99%) aged 45 and over from 2000 through 2010. For both 2000 and 2010, women had a higher rate of total knee replacement (33.0 and 65.5 per 10,000 population, respectively) than men (24.3 and 45.3 per 10,000, respectively). The mean age at total knee replacement decreased from 2000 through 2010 for both men and women aged 45 and over. Higher percentages of men and women aged 45 and over who were hospitalized for total knee replacement were discharged home in 2010 (69.8% and 54.1%) than in 2000 (53.5% and 40.8%). In both 2000 and 2010, a lower percentage of women aged 45 and over (40.8% and 54.1%, respectively) were discharged home after total knee replacement than men aged 45 and over (53.5% and 69.8%, respectively). This entry was posted on Friday, September 4th, 2015 at 12:45 pm and is filed under knee replacment surgery, National Hospital Discharge Survey. You can follow any responses to this entry through the RSS 2.0 feed. You can leave a response, or trackback from your own site.